Have you ever been in the check out line at the grocery store and seen packaged Mistletoe with white plastic berries? A familiar sight around Christmas, I was always intrigued about this plant but never knew much about it. A recent trip to the coast of North Carolina opened my eyes to the stomping grounds of this interesting parasitic plant. Driving along the highway in December from the coast of North Carolina to Asheville on a long drive, I had plenty of opportunity to notice the native vegetation and I noticed large green clumps held high up in deciduous trees. Once the leaves drop, you are able to see large birds nests and other debris caught up in the bare branches and these leafy green balls stood out to me. I realized immediately that they must be Mistletoe and soon saw many of the evergreen balls dotted throughout the forest. Botanically, Mistletoe is especially interesting because it is a partial parasite, a “hemiparasite”. Being a parasitic plant, it grows on the branches or trunk of a tree and actually sends out roots that penetrate into the tree and take up nutrients. But like any other plant, it can produce its own food by photosynthesis. There are two types of Mistletoe. The Mistletoe that is commonly used as a Christmas decoration (Phoradendron flavescens), is native to North America and grows as a parasite on trees in the west in central California, and the east coast. The other type of Mistletoe, Viscum album, is of European origin and very different from the North American, as it is a green shrub with small, yellow flowers and white, sticky berries which are poisonous like the American cousin. One of the most magical, mysterious, and sacred plants of European folklore, Mistletoe was believed to bestow life and fertility, a protection against poison, as well as an aphrodisiac. Sacred to the ancient Celtic Druids, it was used in symbolic ceremonies. Gathered at both mid-summer and winter solstices, the custom of using Mistletoe to decorate houses at Christmas is a survival of the Druid and other pre-Christian traditions and has become associated with many folklore customs. In the Middle Ages, branches of mistletoe were hung from ceilings to ward off evil spirits and over house and stable doors to prevent the entrance of witches. These customs were brought to the new world with the immigration of Europeans and native Mistletoe, though a different variety, was here in abundance. Mistletoe is found in a variety of deciduous trees throughout the U.S., in plant hardiness zone 6b through 11. I live in zone 6b in Maryland, so Mistletoe could be found here! And in fact, according to the Washington Post, in nearby Alexandria, Virginia, an 18″ diameter ball of Mistletoe lives in a tree only four-foot high off the ground! Hardy as far north as New Jersey, its preferred habitat is tidewater areas, thus my sightings on the North Carolina coast. Most of the Mistletoe sold on the East Coast during the holidays is collected from North Carolina. Botanists have noticed a march northwards as well as more abundant specimens which they attribute to climate change or global warming. Bright green oval leaves approximately 1 inch long and one-half inch across line waxy bright green stems up to 20 inches long, make Mistletoe an attractive plant. Bright green male or female flowers bloom in fall, followed by white berries in winter. Containing oxalic acid, Mistletoe can be toxic to some animals, including humans. Birds consume the berries, excrete the seeds which fall onto other suitable host trees. Once germinated, root tendrils penetrate the bark and start forming the typical clump of evergreen foliage. These clumps can reach five feet in diameter and weigh up to 50 pounds. Since Mistletoe is a parasite, a large population of Mistletoe plants on a tree will weaken it and hasten its demise. But the plants are important to wildlife and as well as to humans. Extracts from Mistletoe are used to combat colon cancer that are more effective than chemotherapy. Mistletoe-killed trees provide nesting sites for cavity dwelling mammals and birds. And the living clumps of Mistletoe provide shelter for many birds. Three kinds of U.S. butterflies depend on mistletoe for survival: the great purple hairstreak, the thicket hairstreak and the Johnson’s hairstreak. 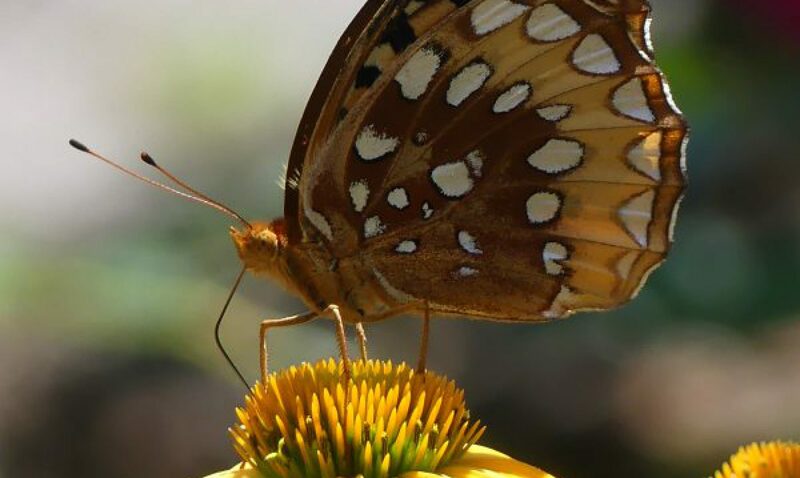 These butterflies lay eggs on Mistletoe, and their young eat the leaves. The adults of all three species feed on Mistletoe nectar, as do some species of native bees. The kissing custom may date to at least the 1500s in Europe. It was practiced in the early United States and each time a couple kissed under a Mistletoe sprig, they removed one of the white berries. When the berries were all gone, so was the sprig’s kissing power. Finding Mistletoe at a local North Carolina farmers market, I snatched several bunches to take home with me for decorations. I asked the farmer who was selling the bunches how he could harvest the clumps high in the tree and he told me that he shoots them down with a shotgun! Thinking he was joking, I talked with others at the market and they confirmed this. Rarely is Mistletoe found at an accessible height and I had no idea shooting was an option. For more Christmas decorating posts, try Williamsburg Christmas, Christmas Wreath-Ordinary to Extraordinary, Holly Love, Boxwood Christmas, Mantel Magic, Succulent Christmas. Very interesting and informative. I knew people shot down the clumps, but you told me many things I didn’t know. Thank you. Thanks Marie. It is amazing how many plants have interesting histories! Thanks funny–I was going to tell you my daddy always said you had to shoot it down with a shotgun. It usually grows too high to harvest easily, so that’s unique to have the large ball growing in VA so close to the ground.